Tensions between the US and China are rising in the economic, diplomatic and military spheres. 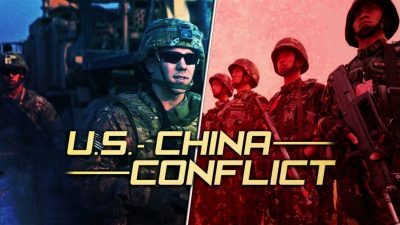 The economic policy of the administration of US President Donald Trump as well as the US strategy aimed at deterring growing Chinese military capabilities in the Asia-Pacific region and Chinese influence around the world in general have led to an open economic and diplomatic conflict between the two states. Since the start of 2018, the US has imposed a series of tariffs on a wide range of Chinese goods and, according to President Trump, is ready to make further steps in order to defend US national interests. On January 22, 2018, the US officially announced their decision to impose duties of as much as 30% on solar equipment made abroad, mostly in China. On July 6, the Trump administration kicked off 25% tariffs targeting $34 billion worth of Chinese goods. These tariffs affected water boilers, X-ray machine components, airplane tires and various other industrial parts. China immediately implemented retaliatory tariffs on its $34 billion list of US goods including soybeans, pork and electric vehicles. At that time, Beijing called the situation the “biggest trade war in economic history.” However, the situation continued to develop. On August 23, the US imposed additional 25% tariffs on $16 billion worth of Chinese imports targeting such goods as electronic parts, plastics, chemicals, batteries, and railway cars. Beijing retaliated with its own fresh tariffs on $16 billion worth of additional imports from the US including fuel, steel products, cars and medical equipment. On September 24, Washington imposed 10% tariffs on about $200 billion worth of imports from China, and threatened duties on about $257 billion more if China retaliated against the action. The Chinese Commerce Ministry answered that it had no choice but to retaliate against new US trade tariffs. Beijing hit back announcing 10% tariffs on $60 billion of US imports. According to the Trump administration the tariffs are needed to protect US businesses, especially industry and intellectual property, and to reduce the trade deficit with China. Since the start of the “trade war”, US and Chinese top officials have held a series of meetings but have found no options to resolve the existing differences. Thus, the conflict expanded into the military and political field. Speaking at a UN Security Council meeting on September 26, President Trump accused China of “attempting to interfere” in the upcoming 2018 election in the US against his administration. Nonetheless, the US president provided no evidence for his claims. Additionally, the Trump administration approved the sale of $330 million of military equipment to Taiwan. This move caused another round of tensions with China. “We urge the US side … to immediately cancel this deal and cut off military ties with Taiwan to avoid doing serious damage to China-US relations, peace and stability in the Taiwan Strait and cooperation between the US and China in important areas,” Chinese foreign ministry spokesman Geng Shuang stated, commenting on the issue. The Taiwan issue has been a focal point of US-Chinese tensions since the very start of the Trump presidency. For example, on December 2, 2016, shortly after his election win, Trump spoke with Taiwanese President Tsai Ing-wen by phone discussing politics, economy, and security in the Asia-Pacific region. This was the first time since 1979 that a US President or President-elect had directly spoken to his Taiwanese counterpart. Trump openly declared that his administration would use the Taiwan issue as a bargaining chip to get a better trade deal with Beijing. The idea that China and Taiwan are part of the same country also known as The One-China policy has been the basis of US-China dialogue concerning the island since the 1970s. The balance of power in Asia Pacific in general and particularly in the South China Sea and East China Sea are also a hot point in US-China relations. The US is actively working to deter the growing Chinese influence on military and diplomatic levels. The US Armed Forces send warships and jets close to Chinese military facilities built on artificial islands, and hold drills near the contested area. The Chinese side is not going to abandon its South China Strategy and responds in a similar manner. In late September the US sent its nuclear capable B-52 bombers to the South China Sea as well as to the East China Sea. On September 26, the US consulate in Hong Kong stated that China had denied a request for a port call from the U.S. Navy’s amphibious assault ship the USS Wasp. On September 30, the Arleigh Burke guided-missile destroyer USS Decatur had an encounter with a Chinese warship, with the two vessels being as close as 45 yards to each other, according to US Navy officials. The US warship was conducting freedom of navigation operations in the vicinity of Gaven Reef in the South China Sea when the incident occurred. In early October, the New York Times reported, citing a US official that China had canceled an annual meeting with US Defense Secretary Jim Mattis planned for mid-October in Beijing. The relations between the US and China appear to be tense and preconditions exist which may cause them to worsen in the near future. Currently, there are two main directions in which the current situation might develop: an escalation scenario and a deconfliction scenario. At the same time, Turkey, China, Russia and India have openly moved to make payments on key contracts, especially in the military industrial cooperation field, in their national currencies as well as boosting their regional cooperation. Thus, the US sanctions policy became a factor undermining the current global economic model guaranteeing its dominance. If the increase of the US pressure on China were to succeed and Beijing and its key partner Moscow were isolated, this would deepen significantly the economic crisis in China, which is expected by some analysts in the upcoming years. Chinese economic development would be stopped or even thrown back. In turn, the US thanks to its industry and postindustrial sector of the economy would make a leap forward maintaining its economic hegemony. Nevertheless, this scenario would be possible only if the Chinese-Russian economic, military and diplomatic cooperation were to be undermined as a result of the smart policy pursued by Washington or for some other reason. Symptoms of this US soft power policy designed to undermine Russia-China cooperation can be observed in the Russian and Chinese media sphere. Multiple Russian experts more or less affiliated with the US ideologically or economically, through grants and funding, promote the idea that Russia should limit its allegedly “unprofitable” cooperation with China and even put effort into deterring Chinese economic and diplomatic policy in the region. On the other hand, some Chinese experts promote an idea that Russia is a weak state and should not be seen as an equal partner. It should be noted that China employing its foreign diplomatic and economic policies does not show any kind of altruism. In fact, it pursues its economic and political goals in the most profitable way. However, this approach is common for any world power defending its national interests. And currently, it’s in Chinese national interests to maintain a mutually beneficial co-operation with Russia and other independent powers. The de-escalation scenario in US-Chinese relations is possible if the Trump administration were to reshape its policy towards Beijing and strike a new political economic deal with the Chinese leadership. So, Washington would have to lift a part, if not all, of the imposed restrictions and maybe soften its policy on China in some points. China would accept such a deal, but would not abandon its goal to dominate in the Asia-Pacific region and then become a superpower. Thus, Beijing would be using this deal to strengthen its economic and political positions in Eurasia and around the world. In turn, the Washington establishment would seek to employ a divide and rule approach to undermine ties between Moscow and Beijing. If this approach were to succeed, the US would be able to deal with its key competitors one at a time. In any of these scenarios, military, diplomatic and economic tensions would grow around the world. The main reason for this is the approach of the Washington establishment, which is steadily undermining the global order established after World War 2. On the other hand, the actions of the Trump administration have their own logic. It seeks to stop the economic development and to limit the influence of their key global and regional competitors, like China, Russia and Iran. In light of the existing mid and long term threats to US dominance, Washington seems to be determined to use the current complicated situation around the world to strengthen the US national economy, in particular its industry, to solve the social and economic problems caused by previous US administrations and to deal with its geopolitical opponents using all existing means and measures.